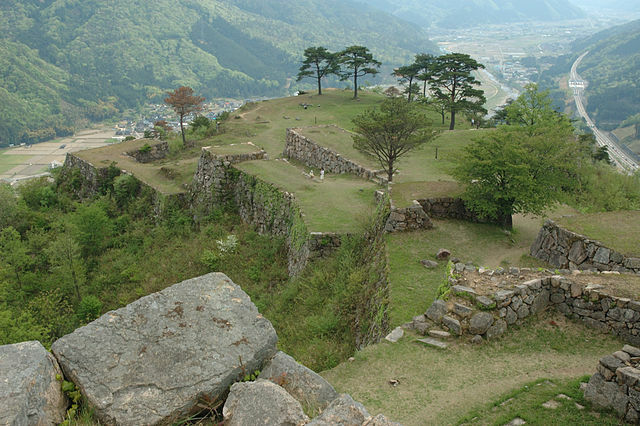 Built in 1441 on the summit of a mountain that towers nearly 300 meters over the surrounding terrain, the ruins of Takeda Castle cover an area about 400 meters in length and more than 100 meters in width. 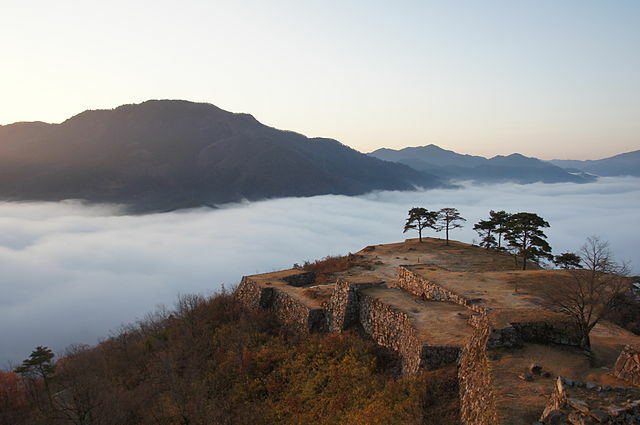 Takeda Castle is often called "The Castle floating in the Sky", because of the way it appears to be floating on a sea of clouds on foggy autumn mornings, and it certainly lives up to its name in its beautiful location high in the mountains. 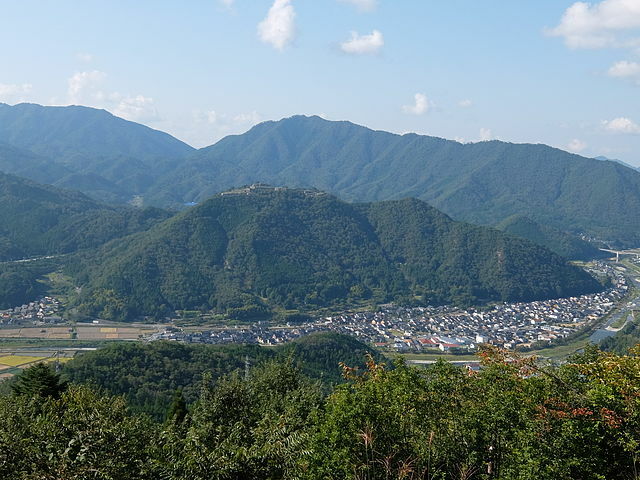 The Castle is in the city of Asago, in the northern part of Hyogo Prefecture. ​Some people try and visit the iconic World Heritage Himeji Castle on the same day, as they are not too far apart. ​In 1577 the castle was conquered by Toyotomi Hideyoshi on one of his western campaigns to reunite Japan. 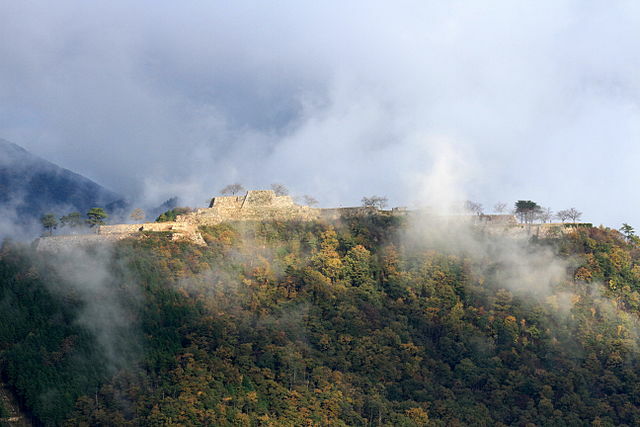 Takeda Castle changed hands several times until Hirohide Akamatsu, a soldier who fought for Tokugawa Ieyasu at the battle of Sekigahara, was appointed its lord in 1600, and the castle was abandoned not long after. It then gradually disintegrated over the centuries until the ruins were restored in the 1970s and 80s and the castle opened as a tourist site. ​The original castle is no longer standing, but the foundations are still largely intact, making it easy to see the castle's layout with a central fortress and three wings emanating from it. The ruins are absolutely stunning when the clouds roll in making them appear to be floating in the sky. The best time to view the phenomenon is in October and November around sunrise "6:00 to 6:30"; when the sky is clear, fog can be seen early in the morning. Some of the best spots to enjoy the amazing view of the castle in the clouds are from Ritsuunkyo on the mountain slopes opposite the castle. 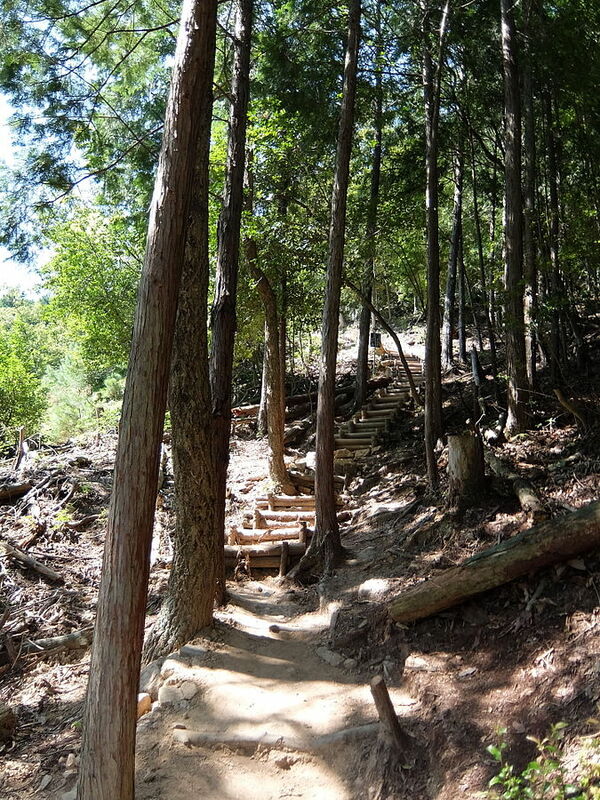 It is possible to reach Ritsuunkyo's parking lot by car, after which a steep dirt trail winds up the mountain with multiple observation decks along its course. The lower decks can be reached in a few steps from the parking lot, but the best views are from viewpoints 1 and 2, which are 30-40 minutes up the trail. ​The Ritsuunkyo parking lot at the trailhead can be reached in a ten minutes' car ride or 45 minutes' walk from the town center. You can hike to the top to reach the Castle’s entrance. There are three tracks; the track behind the station, the one behind the temple and the south path. The strenuous ascent takes about 40 minutes. If you are visiting the castle ruins remember that you can only reach them via a mountain trail, so wear the appropriate shoes and clothing necessary for the hike up the mountain. Even though the Sakura and pine trees were planted on the castle ground by the town of Wadayama, they give the appearance that the castle is slowly being reclaimed by nature. It is a nice place to see fall foliage too. From Himeji: From Himeji Station take the JR Bantan Line, transfer at Teramae Station and get off at Takeda Station "takes about 90-110 minutes". 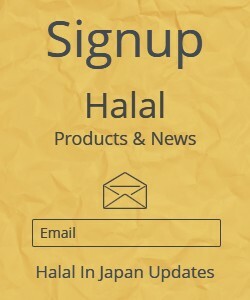 It is fully covered by the Japan Rail Pass, JR Kansai Wide Pass and JR Kansai Hiroshima Area Pass. 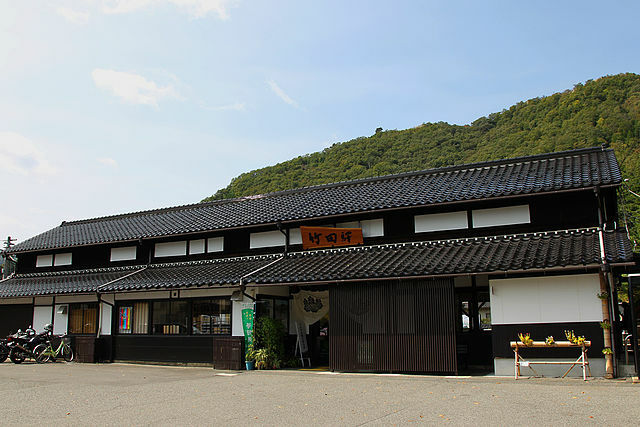 Takeda Station is at the base of the hill on which the castle stands. 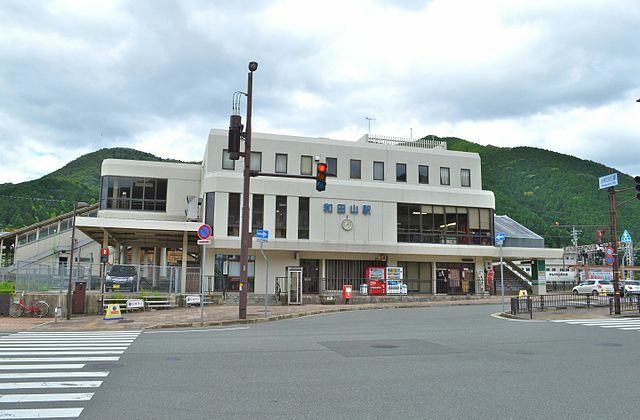 From Kinosaki Onsen: Take JR Sanin Line to Wadayama Station "takes about 55 minutes", and transfer to the JR Bantan Line for Takeda Station "takes about 10 minutes". It is also fully covered by the Japan Rail Pass, JR Kansai Wide Pass and JR Kansai Hiroshima Area Pass. Takeda is most easily accessed from Tokyo, Kyoto and Osaka by taking the Tokaido/Sanyo Shinkansen to Himeji and then transferring to the JR Bantan Line.